Want to grasp spiritual deliverance? Everything you need to know about deliverance and spiritual warfare in one complete manual. This powerful guide gives readers the tools they need to pinpoint the issues they are facing so they can confront the enemy head-on. They will, in turn, be able to see their loved ones and families set free as they go to war on their behalf. Bringing much-needed light to expose the works of darkness, this book also provides specific prayers and names of demons, spirits, strongholds and manifestations, and it provides biblical tactics for defeating them so readers can see their lives return to the place that God designed. 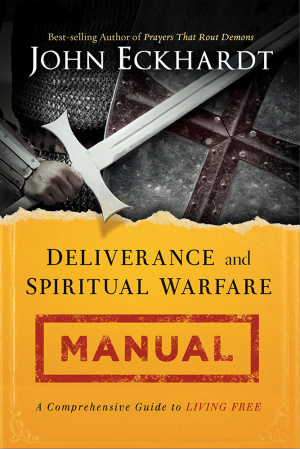 Deliverance and Spiritual Warfare Manual by John Eckhardt was published by Charisma House in November 2014 and is our 15310th best seller. The ISBN for Deliverance and Spiritual Warfare Manual is 9781621366256. Be the first to review Deliverance and Spiritual Warfare Manual! Got a question? No problem! Just click here to ask us about Deliverance and Spiritual Warfare Manual.